"A Keyblade with long reach that provides an outstanding boost in Magic. It also makes it easier to land critical hits, and deals higher damage when you do." 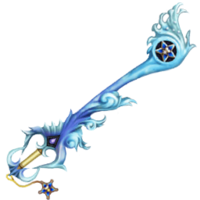 The Brightcrest is a Keychain for Aqua's Keyblade that appears in Kingdom Hearts Birth by Sleep. Aqua obtains the Brightcrest after creating Castle Oblivion from the ruins of the Land of Departure with the Master's Defender. The design of the Keyblade follows Aqua's water theme by being reminiscent of cresting waves, both along the shaft and at the teeth. Also, Aqua's Wayfinder appears at the top of the shaft within a black circle, surrounded by a cresting wave. The hilt has two heart-shaped openings, and the Keychain is also Aqua's Wayfinder. The handle and chain are both an ivory color. "Bright" reflects Aqua's association with Light, while "crest" refers to the crest of a wave, matching the Keyblade's design.